Why is there a tiger instead of a manatee on my cereal box? And why is cereal sold in a box at all? In what ways does packaging affect the supermarket shelves we see and the choices we make? These are some of the questions I have been researching as a food historian and a member of the Food and Wine History Team. Package colors, materials, and other design elements are very deliberate. Much like advertising, packaging appeals to our emotions and directs our attention to specific product features, like health claims or a free toy, while distracting attention from other details, like small serving sizes or questionable ingredients. Below, I’ve shared how contemplating packaging—and the unspoken dialogue between consumers and producers—is one way I try to understand the connection between supermarkets and food consumption habits in the United States. 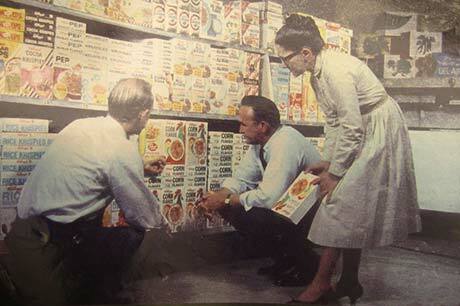 A photograph of designers from Landor Associates studying cereal boxes in a supermarket setting, circa 1960. Landor Associates designed food packages for hundreds of brands when supermarkets were expanding in the 1950s and 60s. This photograph is held in the museum's Archives Center, Landor Design Collection [box 3.21, scrapbook 14]. When I came across a set of 7-Up bottles in a storage area, I learned that they were collected because of their relationship to a nation-wide campaign to adopt the metric system in the late 1970s and early 80s (all of the bottles are either one or two liter in size). But what struck me most about their packaging was not their size, or their experimental shape, but that the bottles were made of glass. All soft drink bottles used to be made of glass and supermarkets were once a place where empty bottles were returned “for deposit.” In the 1950s and earlier, bottlers actually washed the empties and re-filled them. Now, of course, bottles are mostly made of plastic and recycled if it’s convenient to do so. Very few states require deposits to be paid on plastic bottles, and because the composition of plastic can vary, recycling it is less straight forward than recycling glass. Plastic is often preferred by producers and consumers, however, for its extreme versatility, lighter weight, and resistance to shattering. Left: Storage room photo. Even though they are empty, you can see how the heavy glass bottles will leave impressions on the dense foam padding lining the shelf when moved. Right: Photo from a General Cinema Corporation annual report, circa 1980, when every soft drink bottle on the shelf was still glass. Digital copy courtesy of Dave Aldrich. Groceries weren’t always displayed on such orderly, open-access shelving. Before expansive supermarkets with wide aisles became common, goods were located on shelves behind a counter and retrieved by a store clerk upon request. The version of grocery shopping popular today has a specific name: self-service. Publix Supermarkets showcased their wide aisles and a self-service dairy case by driving a shopper around a new store in a tiny car, circa 1957. Photo courtesy of Publix Supermarkets, Inc. When the self service idea was new, a few industries actively promoted it as a way to sell their products to retailers. Manufacturers of shopping carts and open-style refrigerated cases were early proponents of customers serving themselves. A Frigidaire pamphlet designed for retailers and store managers from 1950. The women in the cover illustration are all wearing white gloves, but handling raw meat worry-free thanks to cellophane. This pamphlet is held in the Smithsonian's collection of trade catalogs. Another promoter of the self-service supermarket was E. I. DuPont de Nemours & Company. Invested in the production of cellophane since the 1920s, they recognized the many uses for their product in such an environment. DuPont encouraged both retailers and consumers to see cellophane and self-service as appealing, convenient, and profitable. For shoppers, cellophane advertisements promised greater convenience and cleanliness, without any loss of freedom to see the contents of the package. DuPont believed that if consumers preferred wrapped products and serving themselves, then more store managers would feel compelled to provide it. A magazine advertisement from 1955. Collected by the Food and Wine History Team, National Museum of American History. A few surveys conducted by DuPont’s Market Research Section of the Cellophane Division helpfully explained the advantages of cellophane to butchers, food producers, and “smart merchandisers.” One report, Design for Selling: A Study of Impulse Buying, concluded that half of all buying decisions were made in the store and therefore, “point of sale factors, such as display and packaging become all-important to stimulate unplanned, impulse buying.” And although self-service may have seemed like a threat to the butcher’s job, the report, Self-Service Meats: Progress Report on a Promising New Development, claimed that with the help of cellophane, it would streamline their operations and consumers would buy more if they could serve themselves. Left: A DuPont report on impulse buying. Right: A report recommending the use of cellophane packaging to maximize efficency and profit. The ads, surveys, and reports do not reveal how convincing they were to the intended audiences. But the popularity and staying power of clear, flexible food packaging and the rapid decline in full-service meat, cheese, and produce counters reflect major transformations in the way food is produced for the supermarket and presented to the public. E.I. du Pont de Nemours & Company, Cellophane Division, booklets from 1945 and 1946. Courtesy of the Hagley Museum & Library, catalog # 0802595 and 08025149. Digital photos by Abbey Chamberlain. Another seemingly small change on the supermarket shelf occurred inside one food package in particular: the TV Dinner. When most people see the original TV Dinner tray produced by Swanson’s in the museum’s collections, often they notice its small size first. The tray is of the earliest model produced in the 1950s before a fourth compartment was added for dessert in 1960. The Swanson’s TV Dinner tray, circa 1954. Many see the TV Dinner as an icon of American culture. It represents a moment when pre-processed, pre-cooked food was still novel. It also symbolizes shifting definitions of “meal time,” and our nation’s enthusiastic embrace of the television. An aluminum tray allowed the frozen dinner to be heated in an oven at home, while the divided compartments kept the food components separate and neat, which children found especially appealing. Beginning in the 1980s, Swanson recognized the increasing use of microwaves for re-heating food and switched to plastic trays for all of their frozen meal offerings. The conveniences of pre-processed foods requiring minimal preparation have been popular with busy consumers. Since microwaves can readily be found in most households and in break rooms and cafeterias across the country, frozen meals in plastic trays are not just microwaveable, but more mobile, too. A page from the Tappan Microwave Cooking Guide, published in 1979, gives instructions on “how to microwave a TV dinner.” Although transferring the food to a plate was an option, it was only necessary if “the foil tray was more than ¾ inch deep.” Otherwise, just “cover dinner with plastic wrap, pleated to allow steam to expand.” Photo taken by author at the Reanimation Library. While scientists, health professionals, and others have begun to question the effects of using so much plastic (What effect does it have on our bodies? In the landfills? To the natural environment? ), I stumble onto other questions: How have we adapted to this material? Why do we find it so appealing? Did we behave differently before it became so common? Yet, I never set out to study this material. The predicament of having your research lead to bigger topics and even more questions can be frustrating. Or, if you’re like me, it can be very satisfying and confirm the decision to study an expansive, interdisciplinary topic like food. *The original cellophane produced by DuPont was a cellulose-based material (made from wood). Plastic wraps made of PVC (polyvinyl chloride), a synthetic material derived from petroleum byproducts, replaced traditional cellophane beginning in the 1960s. Cory Bernat is a food historian, graphic designer, and member of the Food and Wine History Team at the National Museum of American History.